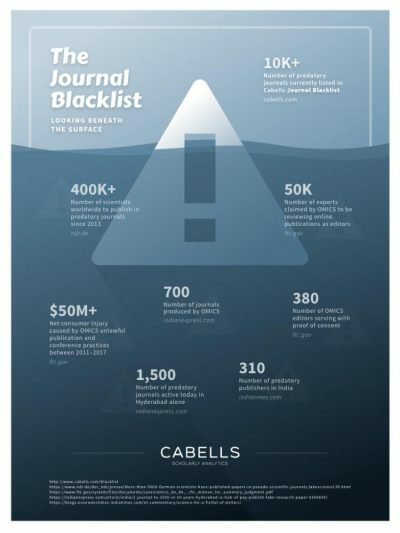 On announcing that the Journal Blacklist has reached 10,000 journals – 10,060 to be precise – there have been two broad reactions. One group of people have said, ‘Wow, I didn’t even know there were 10,000 journals in total!’, while another group has said, ‘Wow, I bet that’s just scratching the surface.’ This underlines the challenge in estimating how large the problem of predatory publishing is, but however large it is, there are ways to circumvent it. One of the many roles the librarian at a university has had over the years is to be the de facto guardian not only of the journal resources they provide in the library, but also to ensure faculty and researchers use legitimate resources outside the library as well. Many have provided invaluable guidance over choosing the right journals to read, use and publish in, a contribution made more and more difficult over time as the number of journals has grown exponentially. In a time of budget cuts, these services have often been retired or forgotten without any substitutes put in place. B – Behavioral Indicators: What is the track record of the journal you want to publish in? Look at its history and appearance online. Read the articles. L – Look, But Don’t Touch: Use investigative skills to ‘research your research’ before making any submission decisions. A – Actively Monitor: Ensure any information used in a decision to publish is up-to-date. C – Community Effort: Journals on the Blacklist, Whitelist or official ranking have used their communities to validate their entries – trust in your communities to help you choose a journal. K – Kickass Metrics: Use citation-based information, such as the Impact Factor, alongside other metrics, such as alt metrics, usage and readership to ensure evidence-based decision-making with a blended approach. L – Legitimacy: Failure to legitimize your journal submission decision can lead to painful consequences – use of the Cabells Blacklist can prevent this. I – Independent: Make sure your investigation of journals is based on independent, verified sources of information. S – Searchable Database: The Blacklist, along with major journal databases such as Scopus and Clarivate Analytics’ Web of Science, are fully searchable and enable comparison of journals across multiple data points. T – Transparency: There are many databases which offer information, but are not transparent. How and where did they get their data? Being critical of any information is vital to ensure optimal decision-making.